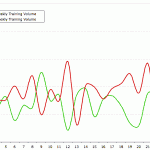 Two of the most popular posts on this site review my training diaries and data to examine what I did in preparation to break 10 hours at Ironman. There are a lot of triathlete’s interested in breaking that barrier – despite being 3 years old those posts remain some of my most read. I’m going to visit the topic from a slightly different angle today – utilising the mass of Ironman results data to examine where and how age group athletes go sub-10 at Ironman. This will not tell you anything about the training involved, but it might help advise race choice and give some indication of the splits required. The table above shows the top level details for this analysis: the races examined, the number of years I’ve looked at in each case, how many athlete results and the proportion that are sub-10 finishers within that. Probably the most interesting statistic is that proportion – certain races stand out for having distinctly more sub-10 finishers. There are many factors that come in to play in determining that percentage, both the course and the quality of the field. A third highest 15.9% at the Ironman World Championships reflects the qualification criteria more than the nature of the course. Races like Sweden, Melbourne, Frankfurt and Austria produce high percentages through some combination of the two – fast courses with a good field. A small aside on the data used – Ironman results are far from standardised and in such a large data set there are many errors. I have done my best to remove erroneous data from consideration and clean up obvious mistakes. Some may have slipped through. I have made choices to exclude one or two instances of races where the best way to clean the results was unclear. Ironman Melbourne 2013 is a good example – I’ve excluded that race due to the significantly shortened swim. Races do vary in exact distances and as we’ll see this is reflected in the average splits; I’ve not adjusted this as these small variations reflect what may be encountered at that race. I’ve seen many discussions of the optimal splits required to break 10 hours. Put simply it will depend on the course. 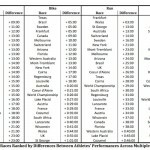 The table above offers the average sub-10 splits seen at each race. As I said it won’t tell you how to achieve them, but it gives a sense of the common requirements for those looking to break the 10 hour mark. You can also observe indications where a race may have a tough bike and so require faster swim and run splits (Lanzarote) or a faster bike that takes the pressure off the run (Austria). We might note that Wales appears to have an unusually fast run split largely the result of a short course in the 2012 edition, although with a challenging bike a fast run is required. At a very simplistic level you could take the average splits and use them as rough performance benchmarks. I want to break 10 hours at Austria (a good choice for it) then I need to be capable of close to an hour in the swim, low 5 hours on the bike and around 3:30 for the run. There are also transitions to consider, but if you’re chasing sub-10 you shouldn’t be spending much time in there. However – time goals on an unknown course tell you little about the actual performance required. Be aware that a 5:30 bike in Lanzarote is a very different beast to a 5:30 bike in Austria. To round out this fairly brief, but data heavy post here are the fastest and slowest splits seen from sub-10 athletes at each race. Here we see how a strong swimmer, cyclist or runner can skew the splits to suit their strengths and still make the goal. I’ll admit we are also likely to see signs of a few errors within the data; I put in a lot of work to clear mistakes, but some may have slipped through. These are the outliers – the 1:35 swimmer who can bike a 4:30. Typically performances lie far closer to the averages, but it is interesting to note that there are many ways to achieve the same goal. My database of Ironman results is largely complete – all but a few results sets available on Athlete Tracker are imported. It opens up examinations of performances like this and the potential to dig further. At the very least I will examine how splits distribute for sub-10 athletes to build a more precise picture of performances at these races. It may help an athlete gauge which race to choose for their sub-10 goal. And potentially there’s more I can do – some work with the TrainingPeaks API could allow me to mine the diaries of sub-10 athletes I coach to build a better picture of typical performances and training for example. I can now expand beyond the sample of one that formed the basis of my original articles.